z = fmdemod(y,Fc,Fs,freqdev) demodulates the modulating signal z from the carrier signal using frequency demodulation. The carrier signal has frequency Fc (Hz) and sampling rate Fs (Hz), where Fs must be at least 2*Fc. The freqdev argument is the frequency deviation (Hz) of the modulated signal y.
z = fmdemod(y,Fc,Fs,freqdev,ini_phase) specifies the initial phase of the modulated signal, in radians. Set the sample rate and carrier frequency. Generate a time vector having a duration of 0.2 s.
Set the frequency deviation to 50 Hz. z = fmdemod(y,fc,fs,fDev); % Demodulate both channels. 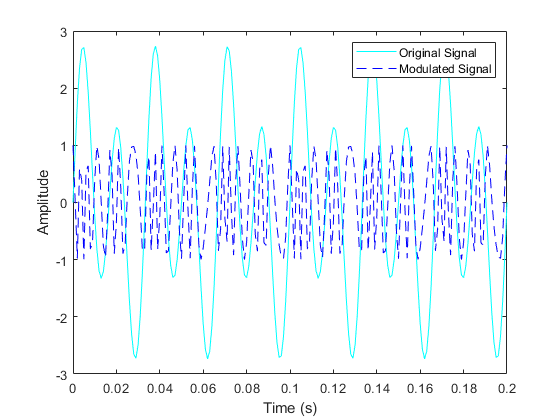 Plot the original and demodulated signals. The demodulated signal is well aligned with the original.